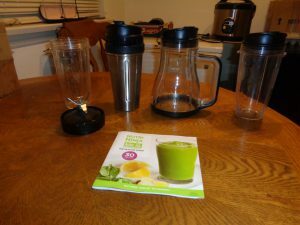 Simply an amazing blender that can make a drink, shake, or smoothie out of anything. Beats the socks off regular blenders and you get unmatchable quality for the price. We can get a few of these benefits from a regular blender. But if we want all the benefits I mentioned above, there’s only one blender that I’ve came across that can do the job perfectly. Introducing the Nutri Ninja Blender! That’s right, you get a portable super delicious healthy drink to take with you anywhere you want to go, whether it’s for a toxin cleanse or a meal replacement. It only take 60 seconds to make! So for 1 minute of your time, you can have your favorite drink/smoothie/meal ready to go in a close lid cup. Let’s dive to to some of the details on this awesome blender, shall we? The complete name of this product is actually Nutri Ninja Blender Auto-iQ Complete Extraction System. Whew, what a mouthful. Just ninja blender is fine by me! The blender produces 1,000 Watts of power, which is what gives it its super duper blending ability. It comes with two 24 oz BPA-free Tritan cups, one 24 oz Doubled Walled Stainless Steel cup, and one 48 oz XL capacity container. You can feed the whole family with just this one set. On top of all that, we also get a recipe book with 30 recipes, ranging from smoothies to soups to exotic juice blends. The XL container comes in very handy when preparing drinks for a group. It definitely makes a big difference in the number of servings we get from that container compared to using the regular size cups. It’s also great if we’re big eaters too! Then we have the doubled walled stainless steel. Imagine on a hot summer day and the sun is beating down on you. You reach for your favorite juice blend/smoothie you made a short while earlier and it’s… warm! This stainless steel cup will keep its contents cold for up to 4 hours after taking out of the fridge. No more worrying about having to refrigerate that drink once we get to the office. Just make sure not to put any hot liquids in it, that’s not what it was made for. This product also comes with three BPA-free sip and seal lids. as long as you have those lids on with the sip closed, there’s no need to worry about a spill at all. We can throw it like a football and not a single drop. 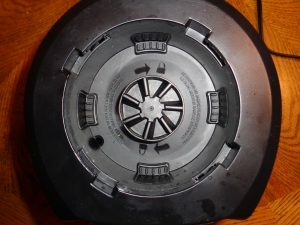 The blade itself is also removable as shown on the image above. So we can out the blade onto any cup or container we want to drink out of, can blend it up with that same cup. After having used this baby for over 3 months, I can honestly give it a 10/10. It has not failed me in any way and I wish I could give it a higher score. Let me explain to you why this is such an amazing blender. Out of the 5 breakdown factors listed, I think the one everyone cares about the most is the quality of our drinks/smoothies/shakes, etc. And for good reasons; why else would we buy this blender over a $15 traditional one? Before I go any further, let me say that I personally make VERY thick meals using this product. From time to time I may make a juice blend or a smoothie, but I main use it for meal replacement because it’s extremely convenient. But I’ve used all of its functions to understand how well it performs with different foods. Beyond the 1,000 Watt motor are other technologies that helps make every blended product a wonderful one. There’s the Auto-iQ Extract, Auto-iQ Blend, Smooth Boost, and Pulse. The Auto-iQ technology detect the food contents inside the container during the blending process. It automatically stops when it detects that unblended solids are at the top and need to settle. After it detect the solids have settled, it automatically starts back up to break up the settled solids. The process is repeated as it detects the need to. It will also stop to prevent motor burnout, which is a great feature to ensure a long lasting product. Earlier when I mentioned the best part about this product is that it take only 60 seconds to make our juice blends, I wasn’t kidding. Either the AutoiQ Extract or Blend option takes only 60 seconds, and you have your drink ready to go! The Auto-iQ Extract is geared toward the blending of nutrient dense foods like kale, spinach, and other veggies and fruits. This option gives us a juice product that’s easily drinkable. This option does exactly as the name implies, it extracts the nutrients out of the food by breaking it down. Have you ever throw away the pit of an avocado because we have no use for it? I think most of us do. Or how about the skin on certain fruits? Those go right into the garbage for many of us. The pit of the avocado actually contains A LOT of nutrients. Although the skin of most fruits contains only some of the nutrients also found in the flesh of the fruit itself, it’s still a waste to dispose of them. The Auto-iQ Extract breaks down all those tough fiber and cellular walls in fruits and veggies that prevents our digestive tract from fully absorbing all of its rich contents. This is what I meant earlier by making our foods more bioavailable. As for the avocado pit? Good luck trying to eat it without choking. The Extract option reduces them to fine dust (at least that’s what I’m speculating since I always mix it with a bunch of other things). The Auto-iQ Blend is for the smoothies and other smooth drinks. This option is great for drinks with a smooth and creamy texture, which is why it makes such great smoothies. It makes a hell of a milkshake as well. As long as what you’re looking for isn’t too heavy or thick, this option to do it for you no problem. No more clumps or hard pieces of solids, lodging in your teeth or getting caught in your throat on the way down. The days of unblended chunks still in our smoothies and drinks are over! This option is an add-on that really puts the icing on the cake for the quality of the end product. Switching on the Smooth Boost option before extracting or blending will give the drink a much smoother feel, just as the name implies. For those of use that like to feel the texture and the fullness of the foods that we’re blending, then simply switch off this option before we extract or blend. I’ve personally tasted the difference with this option on the juices and smoothies that I’ve made. The meal replacements that I use this product for the most doesn’t really change with this option. It is very thick by nature and having tried it both on and off, I couldn’t tell the difference for very thick contents. Nothing too special about this option, but just like smooth boost, it’s another layer of icing on the cake. Holding down the pulse button turns the blender into high gear. Let go of the button to stop. This lets us essentially “pulse-blend” our food to get the consistency we want. Instead of having to turn it on and off separately, we just press the button and hold it for a few extra seconds to get the smoothie is a little less thick. I really cannot point out a flaw when it comes to the quality of the juices and smoothies that this makes. Everything I’ve had so far has been perfect. A definite well-deserved 10/10. With a price tag of $115, this product is a steal in my opinion. The closest competitor is the Magic Bullet Nutribullet Pro 900. This is a great blender, don’t get me wrong. But it’s $120, which is $5 more than the Ninja Blender. 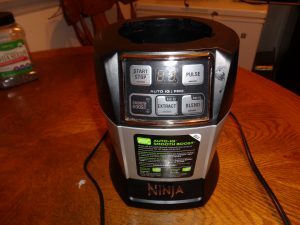 It’s also lower in power, a 900 Watt motor compared to the 1,000 Watt of the Ninja Blender. Not to rip on the Magic Bullet, but it also has less options. Matter of fact, it has no options. The cup is pressed down onto the blender and it blends. The rest of the products on the market doesn’t even compare when it comes to functionality, available options, and the quality of the end product. On the other extreme are blenders that cost upwards of $500. The Vitamix 7500 Series has a 10 different speeds that lets you come up with whatever level of consistency you’d like. I personally think this is a great feature. But at $504, it still lacks options that the Ninja Blender has. I know I’m focusing on the Auto-iQ Extract and Blend options here but those affect the quality of the drinks we make. And beyond the nutrition content of what we’re drinking, the next obvious factor of importance is taste and texture. I’m by no means picking on Magic Bullet here. I have tried their products before and they are great. And as far as price is concern, we see even crazier numbers from brands like Blendtec or Vitamix. We’re talking ranges of high $300s to $600. Although those products give us a whole lot more to work with, each of us should ask ourselves one simple questions: ‘Am I really going to need all those functions?” I said no to that the same way I said no to the extra speeds from the Vitamix simply for the fact that I don’t need it. 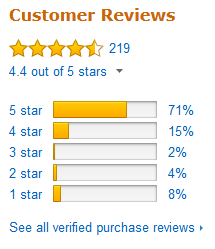 For the quality of the product, the price is beyond reasonable and easily justifies a 10/10. The product comes with an recipe book, which they took the liberty to call an Inspiration Guide (I found it a bit amusing). This nook has 30 recipes that utilizes the different function of the blender. You have other recipes like the Island Mood Boost, Frozen Hit Chocolate, and Crushed Peppermint Frozen Frappe. There’s no shortage of treats in this recipe book. Who said that blending has to be strictly raw veggies anyway? There’s also sample soup, dressing, and even dip recipes included. The book not only gives us something to start with, it shows us what ingredients go together well and what options makes for the best blend. It really sets up the way for us to have our own recipes and get creative with our drinks! So if we look at the cup from the side after we’ve put everything inside, we should see the fruits and veggies on the bottom of the cup and the ice at the top. Now when we flip the cup over to put onto the blender, the ice is now at the bottom and the fruits and veggies are at the top. So use the list above for PUTTING the food inside the cup, not checking the contents after we’ve put the cup onto the blender. I had not expected the recipe book to cover this much and provide this type of value, and for that I give it a 10/10. This product has been very easy to use. Just from the one sample recipe I gave above, there’s 2 steps in making drink. Just put the ingredients into the cup in the specified order, and hit the either the extract or blend button. The automatic 60 second count-down starts and just let the Auto-iQ take care of the rest. There are two other things that stood out to be that adds value to its ease of use. One is the stabilization suction pads and traction pads on the bottom of the blender unit. This really gives the unit amazing stabilization during the blending. As you will see in the demonstration video I made, the vibrations from the blending process is enough to shake a container I had on the table. The suction pads were strategically placed only at the front so that removal is nice and easy. Simply pick up the back of the unit and lift up and the pads pop loose. 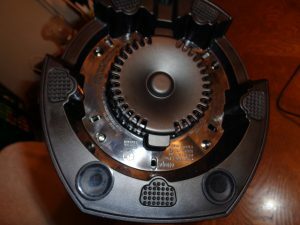 The top of the unit is where we put the cup with the blade cover to blend our food. The locking mechanism used to secure the cup in place is very intuitive and easy to use. You see the 4 notches on the inner cylinder there? Those notches matches the inserts on the side of the cups, which not only secures the cup tightly during blending, it also makes sure only the right type of cup is used. The spinner at the center matches that of the blade spinner on the blade lid. This has the same purpose of ensuring that the proper blade is used for the job. It is not an exaggeration in any way when I say that I’ve never once had a problem with using this product. From my personal experience, the ease of use is a sure 10/10. Are you trying to shed those few extra pounds? Or maybe you’re looking to make your juices and smoothies more interesting? How about replacing your meals with a healthy shake? Whatever the reason is, the Nutri Ninja Blender will definitely give you what you’re looking for. It also comes with free technical support, so if you ever experience a technical problem (I haven’t so far), they’re there to help. Maybe you’re still not sure if this is the exact blender you’re looking for. Hmmm… sounds like this product and offers the biggest bang for the proverbial buck! I’ve tried a few other solutions in the past including a regular household blender, (KitchenAid, I think) as well as food processors, which just aren’t the same, really. I’ve also lived with a roommate who had a Blendtec, and I’ve checked out the Vitamix, too- both are excellent, but those prices… whoa! 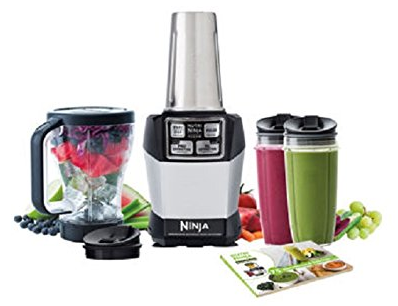 However, this Nutri Ninja seems to be the closest solution for those like me looking for something in between those lower end blenders and the high tech models. I would definitely consider getting one. And BTW – I like my smoothies and shakes extra thick, too! Yes, the other brands are upwards of $350 at least for a comparable product. Glad you like thick smoothies too, they really fill you quick don’t they? I love this! A lot of times people forget to eat or skip a meal because they don’t have the time. That’s why I started blending. I do this with Protein shakes, fruit smoothies, etc. I don’t know why but the fact that this Ninja blender has a digital read out timer got me really excited. Probably because mine doesn’t have that and I now want one… Great post man! Thanks for checking it out. It really is a great bargain and there are way more types of foods you can blend with this than your typical blender. Hope you enjoy the review! I really like this post because I actually had a ninja for myself back some years ago. I thought it was pretty good then but I can see now that they have progressed quite a lot since when I bought mine. Do you know of any good post workout recovery smoothie recipes? I usually like to mix some fruit along with a little orange juice and protein powder but I was wondering if you knew of any additional methods. As far as post workout recovery smoothies, I personally add in any foods considered to be naturally nutrient dense. So things like eggs (sometimes yolks only), goji berries, kale, etc. If you must, then add in some protein powder from a reputable source. But I get enough protein from my meals even from a hard workout. As far as carbohydrates go, the consensus had always been to recover glycogen. If that is what we’re going for, fruits aren’t the best option because they’re mostly fructose, which replenishes mostly liver glycogen instead of muscle glycogen. So from a workout recovery standpoint, it doesn’t do a whole lot for us. It’s better to stick with glucose mainly and some sucrose for muscle glycogen replenishment. But there’s much more to muscle recovery than just diet and I will be writing about that soon. So come back and check it out! Hey, I like this review. I actually have the nutri ninja blender but it’s the smaller version. I think I should have gotten the regular size because I feel like it would be more effective with crushing ice. It’s great as a juicer but it gives me a little of a problem when trying to make smoothies because I add ice and frozen fruit. I will definitely be going for the bigger version. Thank you! Yes, this version has no problems with ice. Matter of fact, it’s one of the things it was designed for, to crush ice and make awesome smoothies and shakes! I never actually owned a blender before, I have used quite I few, I always new there were multiple health benefits by blending different types of ingredients, just until recently I was actually looking for one that I would like to own myself and the ninja blender sounds like a great option, I’m still going to look around a bit, but I’m really considering buying it, thanks for the review! Happy you found this review useful. Blending of certain foods like fibrous veggies breaks down the cellular walls and makes the nutrients more bio-available, so your body can absorb more of it at a faster rate. The ninja really does a great job of that, and the price cannot be beat.